President Muhammadu Buhari addresses the Buhari Media Organisation at the State House in Abuja on June 1, 2018. 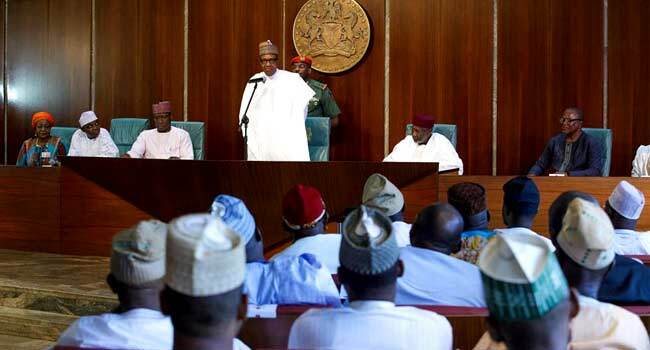 President Muhammadu Buhari says the opposition is in possession of much resources that can sponsor mischief against his administration. The President made the allegation on Friday when he received the Buhari Media Organisation at the Presidential Villa in Abuja. He claimed that the opposition looted so much money before he assumed office, that his administration may not be able to recover all and might use same against his government. “The opposition, now, are sitting on incredible resources which I am afraid we cannot get at it all,” President Buhari told the group. 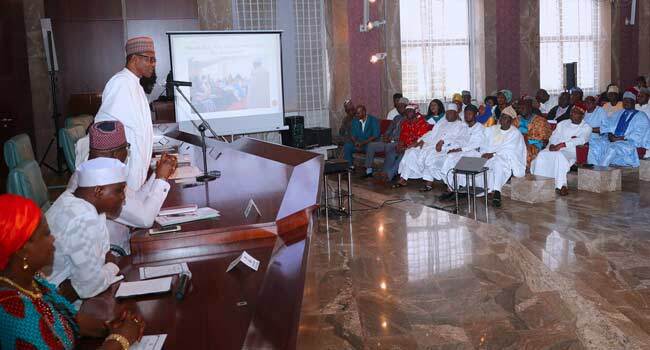 President Buhari, however, urged members of the organisation to continue to support his administration in recovering the looted resources as much as they can. He further praised the support group for its steadfastness, moral uprightness and sacrifice to the nation. The group, formerly known as Buhari Media Support Group, was led to the Villa by its National Coordinator, Austin Briamoh. It comprises retired and serving media practitioners among others, and was the media outfit of the All Progressives Congress (APC) Presidential Campaign Council in 2015. It was later converted to Buhari Media Support Group (BMSG) after the elections and was renamed Buhari Media Organisation earlier this year. President Buhari met with the group in company with the Secretary to the Government of the Federation, Mr Boss Mustapha. Others are Chief of Staff to the President, Mr Abba Kyari, as well as President Buhari’s Senior Special Assistant to the President on Media and Publicity, Mr Garba Shehu, and his Personal Assistant on Social Media, Ms Lauretta Onochia.